★ Watch him take on playtime in style with these colorful baseball caps featuring heroic Blaze and the Monster Machines characters from Nickelodeon. ★ He'll race through the playground with extra confidence with the fast and fearless Blaze and the Monster Machines characters for company. With two unique designs to choose from, he'll be set for whatever the day brings. ★ Durable cotton twill material and an inside sweatband deliver breathable comfort, while the curved brim protects his eyes from the bright sun. ★ 2 PIECE DESIGN SET: Toddler boys 2 piece design set featuring the heroic Blaze and the Monster Machines characters from Nickelodeon. 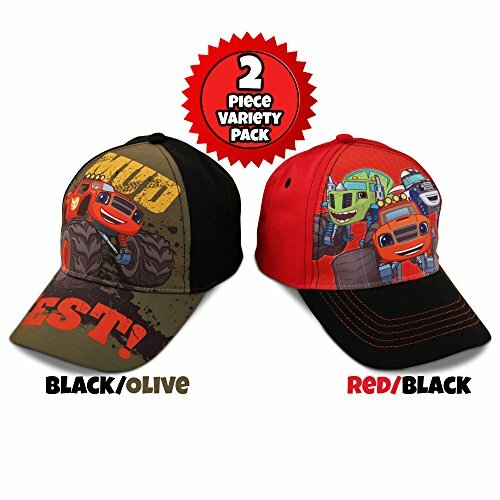 ★ 2 PIECE VARIETY DESIGN SET: The playful 2-piece set includes a red and black cap with Blaze, Zeg and Crusher imagery and a black and olive cap with Blaze and Mud Fest imagery. Designed for toddler boys aged 2-4, each hat features a Velcro closure for an adjustable fit. ★ APPROXIMATE DIMENSIONS: 7" (L) x 7" (W) x 6" (H) - 51 CM. Brim is 2.5" (L) x 6" (W). ★ FUN AND PRACTICAL: He will be ready for all daily activity with these fun and stylish uniquely designed baseball caps. He can mix-and-match his adventurous days between the two caps for a playful look. Nickelodeon Blaze accessories are a great gift that boys will always love to enjoy. ★ 2 PIECE DESIGN SET: Toddler boys 2 piece design set featuring the heroic Blaze and the Monster Machines characters from Nickelodeon. ★ 2 PIECE VARIETY DESIGN SET: 1st cap features red and black design with imagery of Blaze, Zeg and Crusher characters. 2nd cap features a black and olive design with Blaze and Mud Fest imagery. ★ SIZE: Designed for toddler boys age 2-4. ★ APPROXIMATE DIMENSIONS: 7" (L) x 7" (W) x 6" (H) - 51 CM. Brim is 2.5" (L) x 6" (W). ★ CARE INSTRUCTIONS: Hand wash cold with like colors. Non-chlorine bleach. Lay flat to dry. Do not iron. ★ LICENSED: Officially licensed Nickelodeon Blaze product.